A spelling bee is a competition where contestants, usually children, are asked to spell English words. The competition in US is now sponsored and fun by E.W. Scripps Company. The competition has three distinct segments: Preliminaries, Semifinals and Championship Finals. The winner faced a barrage of words like : euphemism; belemnoid; intravasation; erethic; glossophagine; trichocercous; galere; thonnier; chalumeau; dehenstufe; crapaud; kaumographer; tokonoma and knaidel…….. spelled all of them right and won the championship title…. 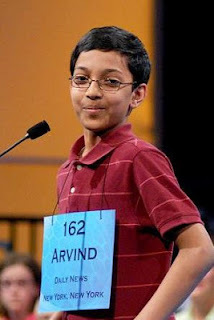 It is Arvind Mahankali from New York who has scripted history by winning the Scripps National Spelling Bee for the year 2013, becoming the sixth Indian-American to win the title in a row. “The words were extremely hard. It means that I am retiring in a good mood,” Arvind said after winning the prestigious national championship. This is the sixth consecutive year that an Indian-American has won the tournament, which was watched live by millions of people in the United States. A grade eight student, Arvind, 13, loves maths and science and plans to pursue a career as a physicist. Arvind had finished ninth in 2010 and third place in both 2011 and 2012. This year there were 281 spellers ; Bee Week 2013 marked the first visit to the nation’s capital for 97 spellers. Speller 94 Tara Singh, of Louisville, Kentucky, was the youngest speller in this year's competition at age 8. Two spellers, speller 91, Vanya Shivashankar, and speller 191, Ashwin Veeramani, have siblings who have previously won the Scripps National Spelling Bee. 1. Arvind Mahankali, 13, Newyork. 6. Grace Remmer 14, Florida; Chetan Reddy,13, Texas and Syamantak Pavra, 12, Texas. The word Knaidel [kenyd-;] a noun from Jewish cookery means : a dumpling, especially a small ball of matzo meal, eggs, and salt, often mixed with another foodstuff, asground almonds or grated potato, usually served in soup. Elected to Rajya Sabha for the fifth consecutive term from Assam, Prime Minister Manmohan Singh yesterday thanked the people of the state, MLAs and Congress President Sonia Gandhi with a pledge to continue to work for the state’s prosperity. “It is a great honour for me that the people of Assam, through their elected representatives in the state’s Legislative Assembly, have given me an opportunity to serve them again,” Singh said in a statement from Bangkok where he is on a visit. Dr. Manmohan Singh is close to 81 the 13th and current Prime Minister of India has weathered many a storms. A renowned economist, he is the only Prime Minister since Jawaharlal Nehru to return to power after completing a full five-year term, and the first Sikh to hold the office. He was born in Gah (now in Punjab, Pakistan), Singh's family migrated to India during its partition in 1947.; studied at Oxford, held several key positions…. Now represents Assam …. In fact he has been representing Assam in the Rajya Sabha ever since 1991; Singh was elected to Rajya Sabha for the fifth consecutive term, bagging 49 first preference votes. Singh was the only contestant for the first preference vote seat as the other parties did not put up any candidate against him. It is another mockery of systems that candidates are put up from places where they have no leaning, thus pushing aside the chances of a local representation…to understand this better………. The upper house of Parliament of India is the ‘Rajya Sabha’. It has 250 members, 12 of whom are nominated by the President of India for their contributions to art, literature, science, and social services. The remainder of the body is elected by the state and territorial legislatures. Members sit for six-year terms, with one third of the members retiring every two years. The Rajya Sabha meets in continuous sessions and, unlike the Lok Sabha, the lower house of Parliament, is not subject to dissolution. The election to Rajya Sabha is by the members of Legislative Assembly of States and Union territories by means of Single transferable vote through Proportional representation. Dr Singh sought-nomination from Assam and the principal opposition in the Parliament, the BJP announced that it would abstain from the Rajya Sabha polls citing that it opposed Prime Minister Manmohan Singh's re-nomination from Assam. BJP state president Sarbananda Sonowal said though Singh represented Assam in the Rajya Sabha in the last four terms, he failed to address the burning problems of influx from Bangladesh and fencing the border with the neighbouring country. The election was not as smooth as it should have been; Firstpost reported that a nervous Congress issued whip to protect the PM. Apprehensive of last minute trouble from dissidents in Assam Congress, the party leadership issued a terse, three-line whip making it mandatory for all legislators to vote for the Congress candidates in the Rajya Sabha polls. After a three-line whip is issued, the voters have to compulsorily show their ballot papers to a polling agent, failing which they might be thrown out of the party. The whip assumed importance considering Chief Minister Tarun Gogoi’s warning to the dissidents on Monday to respect the party position and stay within the ‘Laxman Rekha’. There was apparent tension in the Congress circles with Badruddin Ajmal’s All India United Democratic Party (AIUDF) also fielding party general secretary Aminul Islam for the second seat. However, Ajmal had earlier assured that his party, which is the main opposition party in the state Assembly, would vote for the prime minister. The Congress has 79 legislators in the 126-strong Assam Assembly, while AIAUDF has 18 seats. Dissidence against the chief minister has gathered momentum since March and there have been demands for his removal. BJP has 5 members and has announced that its members will not vote. Assam has two Rajya Sabha seats. When will they ever understand that they are putting theirs and other lives into jeopardy ~ sad to see the technological marvel is being abused so badly. A great means of effective communication, people are not using it but abusing it – you find people talking while driving two wheelers, cars, whilst walking on busy roads, travelling in public transport, while inside Temples, in cinema halls, in public places even in toilets. Reportedly, in UK ‘Professional drivers are the worst text offenders’ that people who drive for their job take more risks behind the wheel. A survey states that people who drive as part of their job are more likely to endanger lives by taking risks behind the wheel. 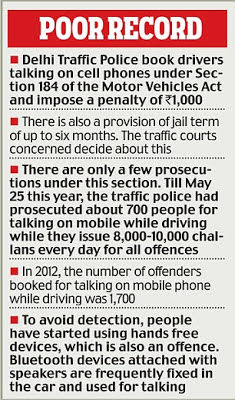 KCAB Home, drivers who use phones at the wheel face 6 months in jail and Rs.1000/- - yes, in Delhi, as Delhi Police step up safety campaign according to this report in Daily Mail of 27th May 2013. The prospect of landing in jail may work where road safety education has failed. Everyone knows talking, or texting, on a mobile phone while driving is dangerous, but that doesn't stop most Delhiites from doing it. The possibility of a prison term, however, might do the trick, the Delhi Traffic Police have come to believe. They now plan a drive to prosecute those who use cellphones while at the wheel. A phoney offender can be booked under Section 184 of the Motor Vehicles Act-1988, and punished with a jail term extending up to six months and a fine of Rs 1,000/-. 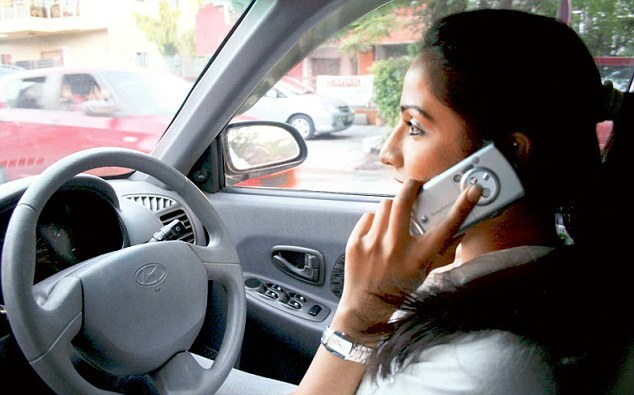 Crackdown: Using your mobile while driving could now lead to a jail sentence… Additional Commissioner of Police (Traffic) Anil Shukla said the habit of talking on mobile phone is tantamount to dangerous driving. "Those caught may be arrested and sent to jail. Their vehicles can be impounded and driving licences will also be punched by the traffic police officers," he added. Though the penal provision for talking on the phone while at the wheel is harsh, it has so far failed to work as a deterrent. This can perhaps be attributed to the traffic police's poor prosecution record. Only a handful of motorists are challaned for the offence. Till May 25 this year, the traffic police have prosecuted about 700 suspected culprits. In 2012, the total number of offenders booked was 1,700. The traffic police had arrested 31 persons and impounded 10 cars last year. The numbers are miniscule considering the traffic police book 8,000-10,000 people every day for all traffic violations. The Delhi Traffic Police, on their part, say there are certain practical difficulties in prosecuting the offenders. They claim that though the use of cell phone by motorists is rampant, it is a little difficult to catch the violators. "Many a time, we don't have clear evidence. Also, the punishment is heavy and we have to act judiciously," said an officer. "When caught, people come up with some or the other excuse. Many claim they were just singing. We can't randomly stop cars on roads and get into arguments with drivers. That will obstruct traffic movement," the officer added. Their task has become even more difficult as people have started using hands-free devices to avoid easy detection by the traffic police. Bluetooth devices attached with speakers are also frequently used for talking while driving. The police say it's for the motorists to be disciplined on the road and have regard for others' - and their own - lives. "We have seen major accidents take place as the drivers were busy with mobile phones. This is a serious issue related to road safety and people should be aware of the danger it poses," Shukla said. If the driver is busy with the phone, s/he has only one hand on the steering, he added. People also take their eyes off the road while talking on phone. "Distraction is there even in the case of handsfree systems. They too divert the driver's attention from the road," the Additional CP said. "The new devices have made it convenient for the people, but they need to be aware of the risks. Our focus is to bring about awareness." The officer said the traffic police will also try and talk to car manufacturers so that misuse of such devices can be prevented. Next time when the cellphone rings in your pocket, or on the dashboard, do remember that a policeman might be watching. Better if you don’t take the call at all when on wheel, irrespective of whether a Police man is watching or not…. Sunil Manohar Gavaskar was quite handsome and played quality Cricket in his days. His defence was strong, his dress was impeccable – he displayed devotion, dedication, determination, concentration, application and more……… He was the first to reach the great landmark of 10000 runs in Test Cricket; wore helmet [specially designed skull protector] only very late in his career and can orate very well. Now that IPL is over, every other channel not knowing what to do has only one panel discussion – ‘whether N Srinivasan should resign or not’. A strong politician was asking whether BCCI is above Police and how they can have a probe………………. could not understand the logic at all…. when something is amiss, it is but the natural for anybody / organization to have a probe at least to know what exactly wrong… what is wrong in BCCI having a probe – whether with N Srinivasan staying or not… anyway that should never impact the Police investigation rightfully. Mr Vinod sought to portray that ‘that Srinivasan should go’ is a public opinion and he has conveyed that – though his opinion is not so at this stage…… he was asked why he lacks the courage to speak out in BCCI. Sunil was smiling all the time and when his turn came – he politely spoke – ‘when India toured West Indies in 1971, the public opinion was that Ajit Wadekar should not be the Captain overlooking Mansur Alikhan Pataudi. Wadekar went on to win 3 Series thereafter and hence public opinion can be wrong and need not be the yard stick’ – the same stout strong defence that he displayed during his playing days. 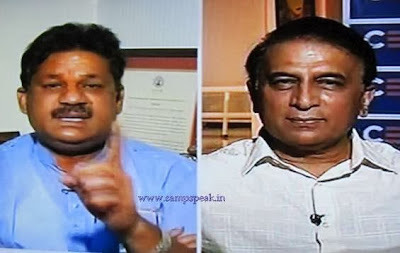 Kirti Azad elaborated the various financial irregularities and improper accounting that reportedly occurred during IPL 2 when the game went to South Africa and asked Gavaskar as to why the report detailing irregularities is gathering dust and no action taken. Sunil again with a smile said…. ‘before I speak anything, Kirti owes me 1 dollar in 1984 and that it has earned much interest’………………..
Wadekar analogy and 1 Dollar……………….. are you able to place anything and this is a elite panel discussion……….. Sure you have enough reasons for liking the master batsman, masterly spokesman named Sunil Manohar Gavaskar who makes you think all the time !!!!!! with regards – S. Sampathkumar @ 0910 pm on 29th May 2013. A newsitem in TOI of date reads ‘Home service takes a beating’…..
We have become slaves to many things….the city man cannot live without many … and there are no alternatives… Geysers, Pressure cookers, Gas stoves, LPG cylinders, mineral water, washing machine, inverter, air-conditioners, cell phones – cell phone chargers, automobiles, elevators – all are basic requirements and people will feel like fish out of water, if for a few minutes there is no charge in the mobile phone…. Gizmos and technology is welcome … but not addiction and abuse …. 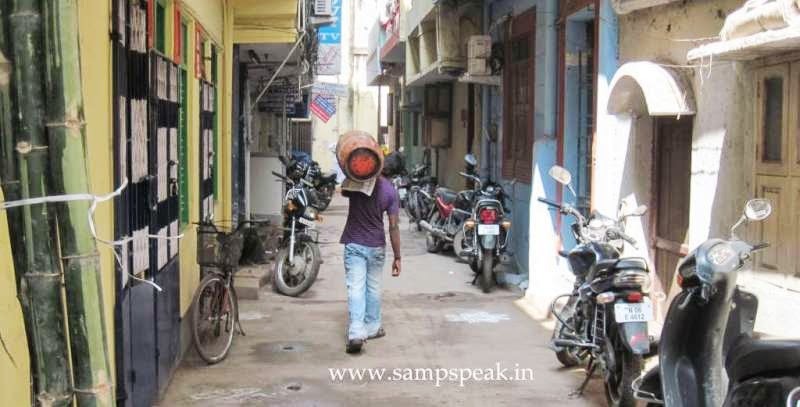 We speak of the sweltering heat and mercury rising … but do we ever care for that poor delivery boy who has to come on a tri-wheeler loaded with cylinders on the same hot sun…… in olden days – residential localities like Triplicane, Mylapore, Mambalam had many tenants co-inhabiting one house… now a days, there are big apartments housing no. of flats.. and in older ones, for reaching 2nd or 3rd floor also, there would be no lift; lift non-functional or no current at the time of delivery. There could also be the menace of dogs and the like….. Here is the article of Times of India titled ‘Home service takes a beating as delivery men wilt in summer’..
Chennai: Delivery boys are the worst hit this summer. Virtually roasted at work, several LPG cylinder delivery men have been staying away from work, affecting supply of gas at homes. Similar is the case of water can distributors, who pedal several kilometers on tricycles with water cans. Both LPG and water are distributed in the city on tricycles which are not motorized. Some distributors have instructed these people men to supply cylinders and cans before noon so that they don’t sweat it out much. Oil companies said that there is no shortage of cylinders, but many residents said that they are not receiving cylinders on time. Captain R S Jagadeeshan, vicepresident of All India Indane Distributors Association said: “There are some difficulties in delivering cylinders to households. So we have asked delivery boys to supply cylinders before noon. Some have started distribution as early as 6am before the sun gets too scorching.” Many delivery men said the experience is hellish. “I feel drained in an hour. I’ve requested my distributor to provide an auto rickshaw or a van to supply cylinders,” said a delivery man. With many quitting jobs, LPG agents are dependent on a large number of migrant labourers from Orissa, Bihar and West Bengal. “Delivery workers have become unreliable. They come one day and disappear the next,” said a distributor on Anna Salai. Evidently the distribution workers don’t think it is worth getting burned out in summer for the 4,500 monthly salary and the average 10 tip they get from a house. “Sometimes I have to climb 50 steps to an apartment on a higher floor. The worst thing is to find the door locked. I don’t have another job, so I put up with the difficulties,” said a delivery man in Perungudi. Water can distributors said that there are only few people willing to take up the delivery job. 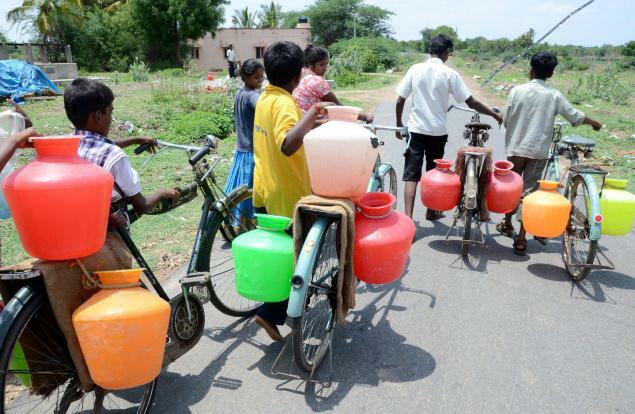 A Shakespeare, general secretary of Tamil Nadu Packaged Drinking Water Manufactures’ Association said: “Many wholesale distributors are not getting enough workers to supply water cans from units to retailers. Many of them have hired migrants who work for 250 a day. Locals charge 400 – 550 per day.” Restaurants too have cut down on daytime home delivery. K T Srinivasa Raja, president of Chennai Hotels Association said many delivery workers have become irregular. “Many restaurants now don’t deliver lunch at homes,” he said. There is also the news that the Tamil Nadu Govt has instructed postponement by a week of re-opening of schools, due to sizzling summer. Dr. Manmohan Singh is close to 81 the 13th and current Prime Minister of India has weathered many a storms. A renowned economist, he is the only Prime Minister since Jawaharlal Nehru to return to power after completing a full five-year term, and the first Sikh to hold the office. He was born in Gah (now in Punjab, Pakistan), Singh's family migrated to India during its partition in 1947.; studied at Oxford, held several key positions…. Now represents Assam …. Now he is on a visit to Japan to strengthen bilateral strategic ties. Dr Singh is seeking re-nomination from Assam and the principal opposition, the BJP on Friday said it would abstain from the Rajya Sabha polls citing that it opposed Prime Minister Manmohan Singh's re-nomination from Assam. BJP state president Sarbananda Sonowal said though Singh represented Assam in the Rajya Sabha in the last four terms, he failed to address the burning problems of influx from Bangladesh and fencing the border with the neighbouring country. Firstpost reports that a nervous Congress has issued whip to protect the PM. Apprehensive of last minute trouble from dissidents in Assam Congress, the party leadership has issued a terse, three-line whip making it mandatory for all legislators to vote for the Congress candidates in the Rajya Sabha polls on Thursday. Prime Minister Manmohan Singh is one of the candidates. After a three-line whip is issued, the voters have to compulsorily show their ballot papers to a polling agent, failing which they might be thrown out of the party. An Adivasi leader from the Christian community, Santiuse Kujur, is the other Congress nominee for the second seat. The whip assumes importance considering Chief Minister Tarun Gogoi’s warning to the dissidents on Monday to respect the party position and stay within the ‘Laxman Rekha’. Following Gogoi’s diktat, the dissidents today met All India Congress Committee secretary Pervez Hashmi and discussed the emerging situation. After meeting the dissident MLAs, Hashmi made an effort to put up a united front within the state Congress unit. “It was just a courtesy call. There is no trouble in the party. We are all united,” he said. Trouble began for the Congress when Gogoi announced Kujur’s candidature for the second Rajya Sabha seat. A newcomer to the party, Kujur had unsuccessfully contested from Panery constituency as a Congress candidate in the Assam Assembly polls in April 2011. Amguri MLA Anjan Dutta recently expressed his displeasure over Kujur’s candidature saying the latter did not represent all sections of the society and the decision to make him the party candidate was taken by the chief minister unilaterally. The lawmaker had claimed that he had the support of 25 other Congress MLAs supporting his view. The tension in the Congress circles is apparent with Badruddin Ajmal’s All India United Democratic Party (AIUDF) also fielding party general secretary Aminul Islam for the second seat. However, Ajmal had earlier assured that his party, which is the main opposition party in the state Assembly, would vote for the prime minister. Singh in all likelihood will not face a problem as all dissidents in the party have agreed in principle to vote for the prime minister. However, Kujur’s fate hangs in balance if the dissidents decide to ignore the party whip. In any case, the Congress top leadership is not willing to take a risk and hence the whip. The Congress has 79 legislators in the 126-strong Assam Assembly, while AIAUDF has 18 seats. Dissidence against the chief minister has gathered momentum since March and there have been demands for his removal. The nomination of Kujur only allowed a second group of dissidents to come to the fore. BJP has 5 members and has announced that its members will not vote. Assam has two Rajya Sabha seats. There are Govt projects and schemes, not all attract the attention of common man …… this one can perhaps change the lives of thousands of common public….. some of the residents still could not believe that this is to happen from today. It has been such a long wait that so many living in the rural areas of this corridor would jump in joy as the scheme has been completed and is being commissioned today. It is a scheme to overcome the impact of fluoride in groundwater on 33 lakh people in the two districts that are known to have mostly barren hills and parched lands. It actually is a place where people escape to in hot sweltering summer ~ it has a water falls and still you call it barren hills and parched lands… !!!! It is ‘Hogenakkal Falls’ on river ‘Kaveri’ located in the Dharmapuri district of Tamil Nadu ~ about 180 km from Bangalore and 46 km from Dharmapuri town. Dharmapuri and neighbouring Krishnagiri districts of Tamil Nadu are drought prone and had been the cause of high political debates and riots. Although the Kaveri river enters the state at Biligundulu in Dharmapuri district, it does not contribute to irrigation or drinking water purposes there. Sadly it is also the place affected by fluorosis. So common public do not get potable water and there is always water crisis, especially the drinking water. Those living in the city and used to mineral water life, can perhaps never understand this endemic. The project being flagged off by the CM Ms J Jayalalithaa could change the lives of people in these districts. Hogenakkal Integrated Drinking Water Project is a fluorosis mitigation drinking water project executed by Tamil Nadu Water Supply and Drainage Board (TWAD), with funding from Japan Bank for International Cooperation (JBIC) using Tamil Nadu\s share of Cauvery river water. The project aims to supply safe drinking water to drought prone fluorosis affected Dharmapuri and Krishnagiri districts of Tamil Nadu. The total cost of this entire flourosis mitigation project is put at Rs. 13.34 billion. 1.4 tmc feet of water is to be utilised for the Hogenakkal drinking water project. For smooth functioning, the TN Govt obtained NOC from Central Govt as also with the J. H. Patel led government of Karnataka in 1998, based on the premise that both states won't obstruct drinking water schemes from Cauvery as long as the water drawn for such a project is sourced from the respective state's share of Cauvery water, whose proceedings have been recorded. The project is expected to cover 6,755 households in three municipal areas, 17 panchayats and 18 town panchayats, benefiting about three million people. Drinking water will be pumped to a master balancing reservoir at Madam, about 11 km from Hogenakkal. After treatment, water will be pumped for 145 km to cover areas such as Palakkodu,Marandahalli and Hosur in Tamil Nadu. Remaining areas in Krishnagiri and Dharmapuri districts will be covered by taking advantage of altitude gradient. So, today 29th May 2013 is a red letter day for these people in the water deficit districts of Krishnagiri and Dharmapuri as they are poised to get potable drinking water for the first time. Tamil Nadu chief minister J Jayalalithaa will launch the 1,928 crore Hogenakkal Water Supply Scheme today, paving the way for supply of water free of fluoride that has led people to suffer from skeletal and dental fluorosis besides a host of other ailments over the years. The project, first proposed in the 1960s when K Kamaraj was the chief minister, will draw on Cauvery waters near the Hogenakkal falls in Dharmapuri district. The government’s water quality analysis reports show that the concentration of fluoride in ground water in many parts of these districts ranged from 1.5 mg/l to 12.4 mg/l which is in excess of the permissible limit of 1.5 mg/l. During an assessment for dental fluorosis among 3.8 lakh school going students in these districts, the state health department found the intensity of the problem was severe in 3% students, while it was moderate among 10%. It is stated that 3 generations had been affected by high-fluoride content water and this sure would help the people of the districts. A remarkable feature of this project is that besides providing drinking water, water pits have also been created to provide water to wild animals, especially elephants, living in forest ranges, where pipes are laid along roads passing through the forests. Residents at Alamarathupatti say they have been fetching 20 pots of water a day from a borewell, located two km from their village. Men use mopeds or cycles to carry four pots of water each, while women walked with two pots each. All this is set to change. Dental fluorosis, also called mottling of tooth enamel, is a developmental disturbance of dental enamel caused by excessive exposure to high concentrations of fluoride during tooth development. The risk of fluoride overexposure occurs at any age but it is higher at younger ages. Skeletal fluorosis is a bone disease caused by excessive consumption of fluoride. In advanced cases, skeletal fluorosis causes pain and damage to bones and joints. Happy that a welfare scheme is getting inaugurated today.. Crowds throng Marina beach, especially this summer … and if you are to walk on the sands you would see many cheap kattumarams [catamarans] as also some boats… the livelihood of lots of fishermen and on the sea, you could see some cargo ships….scenic setting for a Marine enthusiast. Days after the Finals of IPL 6 when N Srinivasan was booed by a section of the crowd, things have not changed much…. He has not been given out, nor is he a walker….. a not so media savvy, Gurunath continued to hog the limelight with channels showing live, his coming out of Mumbai airport. Gurunath Meiyappan, a top official of the Chennai Super Kings franchise and son-in-law of the BCCI president N Srinivasan, has been formally arrested by Mumbai Police on charges of cheating, forgery and fraud. There have been statements – one after the other, on his role not in betting but on the franchisee itself. The avid golfer is in no mood to tee-off…. At a time when many is braying for his blood, Srinivasan still has his supporters. The system has never been transparent, it has always been dictatorial and has never been answerable. So why should just Srinivasan resign, everybody on the governing council should go. He has not committed any crime but rather an error of judgement, Saad Bin Jung, former cricketer and nephew of the late Mansoor Ali Khan Pataudi is quoted as saying. Some reports suggests that he has the support of committee including that of Jagmohan Dalmiya ~ some media has it that he is inspired by Robert Vadra, who has been accused of benefiting in financial deals due to political connections in the past, but has resulted in no major changes in the Congress. Chennai has a fishing harbour; has iron ore / coal imports; lots of container movement; cars gets exported from here……but is no place for Yachts. Yachts are recreational boats. The term originated from the Dutch Jacht meaning "hunt". It was originally defined as a light fast sailing vessel used by the Dutch navy to pursue pirates and other transgressors around and into the shallow waters of the Low Countries. A double-decker yacht docked at Chennai Port since last month has been the envy of fishermen, sailors and onlookers even though two more luxury boats are berthed alongside. Going by the report in The Hindu, the first one outscores the others in terms of features, size and cost. 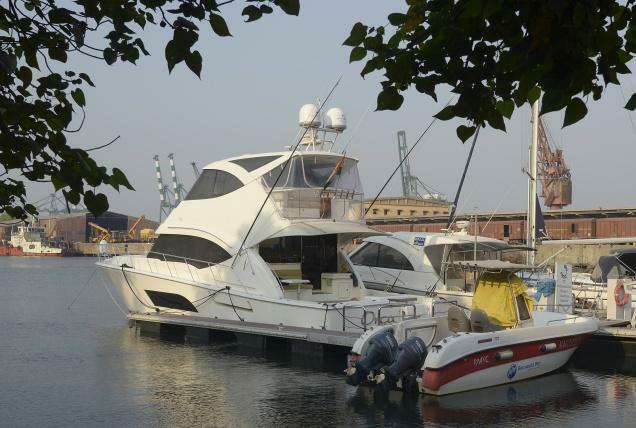 The yacht is owned by Gurunath Meiyappan, who was recently arrested on IPL betting charges. That is also in news as reports suggest that a police team from Mumbai on Monday completed its search of the house of Mr. Meiyappan and his 70-foot-long yacht. Three mobile phones, two from his house and one from his yacht, reportedly were recovered. On Monday, a seven-member team from the Mumbai Crime Branch inspected the double-decker, ‘Riviera 53 Enclosed Flybridge’. A top Chennai Port official said: “We issued them entry passes. They left the place after inspecting the yacht and were not willing to divulge any details as they are probing the case from different angles.” The vessel costs about Rs. 5 crore and further Rs. 3 crore as customs duty. It is stated that the Customs department delayed the release of the cruiser by a couple of days as the base duty was hiked from 10 to 25 per cent in the last Union budget. According to the Hindu, the yacht was imported from Riviera’s Gold Coast factory in Australia only last month, though Mr. Meiyappan had bought it last year. Shipped from Gold Coast to Hong Kong, it was lying there for over four months owing to non-availability of a ship to take it to Chennai. A Chennai Port official told The Hindu that the cruiser, described as a growing breed of yacht with “fishability” as one of its features, was allowed to berth at an exclusive spot on a request from the Tamil Nadu Sailing Association, of which Mr. Meiyappan is an institutional member. It has been used only sparingly. “We can easily say Riviera 53 Flybridge is the only yacht present on the southern coast. Such yachts can be seen in Mumbai or Kochi. At present, there are 25 luxury boat owners in India, most of them businessmen,” an association member is quoted as stating. Riviera, in its recent newsletter, announced the yacht’s arrival in Chennai and said the owner spent a week on board for a shakedown to educate and familiarise himself with all on-board systems, before it was shipped to India. It is not the first Riviera to reach the Indian shores but it is first in terms of size and the first game fishing boat to be berthed in Chennai. The first trip offshore was a fishing expedition 15 nautical miles off the coast, said the newsletter. So would you consider this a Marine related post or a Cricket related one ! 1) Free Medical Centre functioning in our premises at Triplicane, Opp.to Bharathiyar Illam catering to poor. Here we charge Rs.2/- for Registration – Consultation and medicines are given free. Daily around 50 patients avail this facility. We have a Medical lab also functioning here. 2) SYMA Growth : Our tuition centre where we teach around 130 students without charging any fees. [X Std – 1 Tamil ; 1 Eng medium: +2 Science Group & Commerce Group – one class each]. This would start around July and run till Feb end – all days of week – 2 hours daily. Besides, we are engaged in multifarious activities. Every year we distribute around 1200 sets of uniforms to economically poor students. In our Educational Aid programme, we also give financial assistance to those achievers of our Tuition centre and financial assistance to select college students. SYMA is helped by many philanthropists and kind-hearted persons and we generally collect donations prior to our Educational Aid programme, which is slated to be held in the first week of July 2013. Recently we had our AGM and new set of Office bearers have taken charge – the continuity is ensured and SYMA will continue to serve the society with the renewed vigour. ü Also our heart-felt regret for the departed souls of SYMA members. We seek your continued patronage and thank you for all the finance and other support that you have been providing to us. We have progressed thus far and have been able to render meaningful service to Society with the support of people like you. A Big Thank you to All of you. Cheque(s) / Demand Drafts (s) may be drawn in favour of – SRINIVAS YOUNGMENS ASSOCIATION, payable at Chennai. SYMA is a registered entity and donations are eligible for deduction under Sec.80G of the Income Tax Act, subject to the limits prescribed therein. PS: for those of you receiving Bliss for the first time – SYMA, the organization from Triplicane has been rendering social service for more than 36 years now. BLISS is its newsletter [voice of SYMA] and Yours Truly has been the Editor for nearly 10 years now…..
Why is there no human rights for Police and army personnel – why those who stand up even for those committing crime, turn silent when security personnel get killed and maimed… remember Tarmetla !! Tarmetla is in Dantewada District, - South Bastar of Chattisgarh. Before Indian Independence, the district was part of the princely state of Bastar. After Indian Independence in 1947, Bastar's ruler acceded to the government of India. After the brutal killings of Congress men in Chattisgarh, the security apparatus is grappling with the fall out of the Maoists attack and the man who is decide is away ~ Home Minister Sushilkumar Shinde is in the United States and will return only on Wednesday. Shinde, left New Delhi on 19 May to attend the Indo-US Homeland Security dialogue and is not cutting short his visit. It is reported that except Shinde, all other members of the Indian delegation who went to the US to take part the May 20-22 bilateral meetings, have returned home. Some news reports indicate that the Home Minister stayed back in the US after 22 May for private purposes and there was no official engagements to attend. Meanwhile, Prime Minister Manmohan Singh, Congress President Sonia Gandhi, party Vice-PresidentRahul Gandhi, Minister of State for Home RPN Singh, Home Secretary Designate Anil Goswami had visited Chhattisgarh yesterday while Union Home Secretary R K Singh, Director of Intelligence Bureau Syed Asif Ibrahim and other senior Central officials will visit the state tomorrow. The Home Minister yesterday said that he had spoken to Chhattisgarh Chief Minister Raman Singh and announced the handing over the probe into Saturday’s incident to NIA. Close on the heels of brutal killing by the Maoists, Arundhati Roy in an interview to CNN-IBN told that the Maoists have no choice but to indulge in ‘counter violence’. Head of this Italian businessman - Carlo Pietro Giovanni Guglielmo Tebaldo Ponzi ! Even the most intelligent and thoughtful sometimes slip and fall….a few years ago, somebody promoted scheme wherein you put money, then enroll friends under you – the friends enroll more people and money would keep flowing …. A chain scheme and you get introductory gifts and many more….. me, though not averse to indulging in forms of gambling still was not attracted – some of my friends did and…………………………………. You sure know this ~ perhaps directly – knowing, buying or even selling its products… ‘Amway’ - (short for American Way), an American multinational direct-selling company that sells a variety of products, primarily in the health, beauty, and home care markets to consumers and independent business owners. mway was founded in 1959 by Jay Van Andel and Richard DeVos. Based in Ada, Michigan. Amway conducts business through a number of affiliated companies in more than a hundred countries and territories around the world. Many believe that Amway products are good quality though somewhat expensive. Amway has no shops; you would not find its products in Supermarkets ~ but sells through MLM. Multi-level marketing (MLM) is a marketing strategy in which the sales force is compensated not only for sales they personally generate, but also for the sales of the other salespeople that they recruit. This recruited sales force is referred to as the participant's "downline", and can provide multiple levels of compensation. It is also known as ‘pyramid selling’. Most commonly, the salespeople are expected to sell products directly to consumers by means of relationship referrals and word of mouth marketing. In West Bengal there is news of another death…… 18th since the Saradha Group meltdown in West Bengal. Reports state that Swapan Majumdar (42) hanged himself from the iron railing of the terrace of his two-storeyed house at Belghoria in the northern suburbs of Kolkata around Saturday midnight. Majumdar was an agent of Ramel Group of Industries, a Kolkata-based money marketing company. He had collected Rs 16-17 lakh from around 65 depositors in the Belghoria-Sodepur region over three years. Formerly a private tutor, Majumdar was known as a man of integrity and was implicitly trusted by depositors, his family said. Despite payment defaults, he didn't face threats or abuses but was on the edge when hundreds of the depositors protested in front of the Sodepur office asking for their money. From Kerala comes the news that Amway India CEO, MD is arrested for financial fraud. First Post quoting Mathrubumi reports that the Kerala Crime Branch has arrested Amway India Managing Director and CEO William Scott Pinckney and two other directors of the network marketing company. Amway has been accused of selling low- priced products at inflated prices. The arrests have been made in relation to two cases of fraud registered against the Pinckney in Wayanad district of Kerala, the report said. He was in Kerala to secure anticipatory bail in these cases. He has already got a bail in another case registered against him in Kozhikode district. According to a report in India Today, Pinckney, Sanjay Malhotra and Anshu Budhraja were questioned earlier this month and asked to report to the police on Monday, when they were again interrogated by the Economic Offences Wing and later arrested by the Wayanad police. Earlier, the Crime Branch had seized products worth Rs 2.5 crore from various go-downs across the state and arrested the Kerala chief of the company. After this arrest, the crime branch had decided to probe Amway’s insurance business, an earlier Mathrubhumi reportsaid. There were complaints that Amway had supplied new products to distributors at high price. Lakhs of rupees thus collected was invested in the insurance business, the report said. A probe into the multilevel marketing firm found that products that were Rs 37 was sold to consumers for Rs 395 as MRP. The investigation was conducted after Vishalakshi from Kozhikode complained that she lost Rs 3 lakh on selling Amway products. Now coming to Ponzi ~ Ponzi scheme is a fraudulent investment operation that pays returns to its investors from their own money or the money paid by subsequent investors, rather than from profit earned by the individual or organization running the operation. The scheme is named after Charles Ponzi. This Italian businessman became known in the early 1920s as a swindler in North America for his money making scheme. Charles Ponzi promised clients a 50% profit within 45 days, or 100% profit within 90 days, by buying discounted postal reply coupons in other countries and redeeming them at face value in the United States as a form of arbitrage. So after immersing themselves before the TV sets for such a long times, watching everything including the ungainly dances and sordid episodes of match-fixing, what will the Indian fan do from today ? 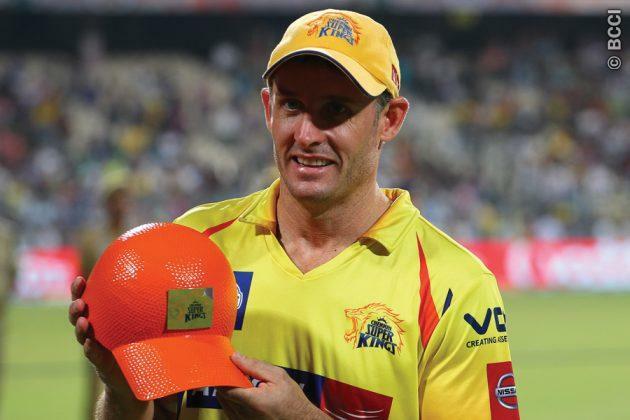 For CSK, Michael Hussey has the most prolific scorer [in fact the highest aggregator in the tournament – 733 – getting the Orange cap] ; yesterday he scored more than 5 of his teammates aggregated……….. he scored 1 ~ while Raina, Badri, Jadeja, Morris, Mohit… made ducks ….. In between, do you remember the 62nd match of the tournament between MI and Sunrisers played at Wankhede on 13th May 2013 and in particular the 12th over bowled by Karen Sharma and to be more specific the 4th ball !!! It was a win for Mumbai Indians as CSK faltered….. when Pollard pulled Morris away for four, after fielding the next ball in his follow-through Morris blew a kiss at Pollard. The batsman blew a kiss back to Morris ~ after the match MI were too jubilant that there were not even the formal handshakes ~ sometimes winners do behave pretty badly. The margin was 23 runs but the match was won long before. Chasing MI’s 148 for nine in 20 overs, CSK managed only 125 for nine in 20 overs. Skipper Mahendra Singh Dhoni — 63 not out off 45 balls with three fours and five sixes — waged a lone battle as the Chennai team. Earlier, restricting MI to 148, CSK fans were hoping for an easy win which was not to be. Infact, MI were 16/3 losing Dwayne Smith, Tare and Rohit Sharma early. Pollard played sensibly. Chennai had worser start – Hussey went making a solitary run, Raina failed to disturb the scores, the umbrella man Badrinath, who did not get many opportunities to exhibit his wares also followed similarly and at 7.3, defeat was starring at the barrel – it was 39 for 6. For the Mumbai outfit, which lost to CSK in the first qualifier on May 21, it was sweet revenge. Tendulkar, who has won important tournaments in his fantastic career spanning nearly 24 years, now has the IPL title too in his collection. Sachin Tendulkar on Sunday announced his retirement from the cash-rich Indian Premier League soon after Mumbai Indians won their maiden title. “For World Cup, I had to wait for 21 years but for this I had to wait for only six years. Also this is special for me as I won’t be playing in IPL next season,” he said at the end of Mumbai Indians’ triumph. “I think this is the right time to stop playing IPL. Just got to accept the reality that this would be my last season,” he told the presenter. The last ball Tendulkar played in the IPL didn't come in the victory in the final, but it was that ball referred to in the 2nd para of this post. That ball was sent over long-on for a six, but in the process Tendulkar also injured himself. He retired-hurt after that, and didn't recover in time to play another Mumbai game. Ironically, this time the followers of Sachin are heaving a sigh of relief with the announcement of his retirement from IPL. BCCI president N Srinivasan has promised a fair investigation by a three-member commission, which will include a person independent of the board, into the charges against Gurunath Meiyappan, the CSK official and Srinivasan's son-in-law who has been arrested, and the three Rajasthan Royals players allegedly involved in spot-fixing. Srinivasan said he would not be part of the commission and would not be part of its appointment or work. Srinivasan said the commission would comprise an independent member and two of the following people: IPL chairman Rajiv Shukla, BCCI vice-president Arun Jaitley, BCCI treasurer Ajay Shirke, board secretary Sanjay Jagdale, and former India captain and commentator Ravi Shastri. Srinivasan is however firm that he need not resign for this scandal………. Jungle life is different ~ there cannot be a casual moment, when it comes to survival.. Sure you would have seen this poster elsewhere…. 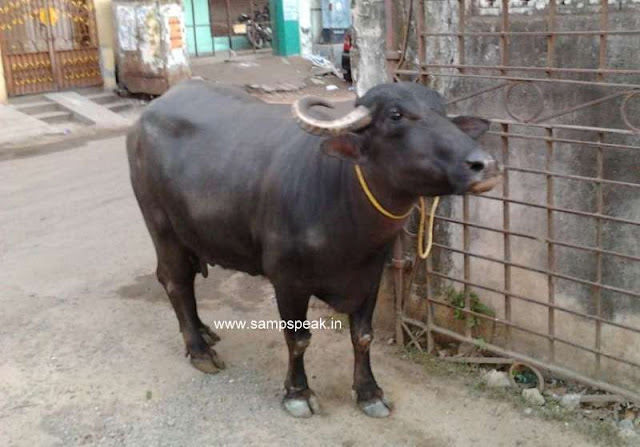 How do you start your day… in Triplicane, as you come out early morning, you are sure to find cattle ~ cows and buffaloes roaming on the street. The buffaloes are considered lazy and carefree animals…….they occupy the centre of the road and do not care to move … the buffalo that we see on road is commonly known as ‘water buffalo’ - (Bubalus bubalis) suitable for tilling rice fields, and their milk is richer in fat and protein than of the dairy cow. By some accounts, Water buffaloes were domesticated in India some 5000 years ago ! There is also the ‘slow buffalo’ – slow buffalo ~ what ? : In wild, a slow buffalo is an old, diseased, or otherwise weak buffalo that trails at the back of the herd. A herd of buffalo only travels as fast as its slowest member, so the slow buffalo slows the entire herd down to its speed. Wolves and other predators often hunt the slowest, weakest members of a herd because they are the easiest to catch and the least likely to do any damage fighting back. The Slow Buffalo Theory says that when a predator takes out the slow buffalo, it is actually beneficial to the herd, because then the slow buffalo no longer impedes the entire herd. There is also no chance then of the slow buffalo breeding, so in the case of a disease-prone or weak or clumsy animal, its death ensures that the weaker genes will not continue in the herd. Predators thinning the herd of these slow buffalo are a form of natural selection. So ‘Hunters and Hunted’ are common in wild…. But not what you are about to read based on a newsitem in Daily Mail in 3rd May 2013. Hunter becomes the hunted as this not-so-fierce lion is forced to flee with his tail between his legs by an angry herd of buffalo. 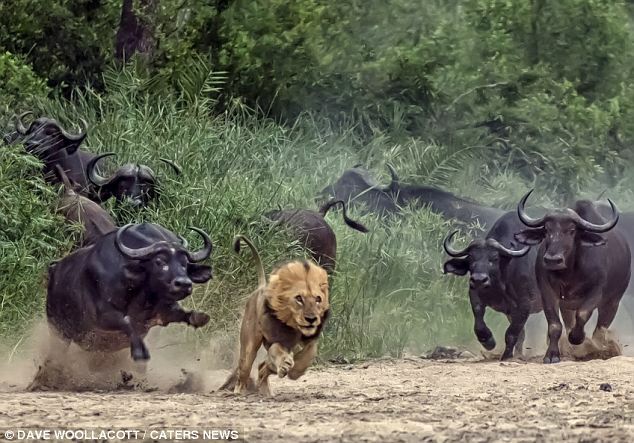 Lion no doubt is majestic, the King of Jungle and is feared by other animals………… but in an eerie scene, this lion found himself outnumbered after mistiming his pounce on this herd at Kruger National Park in South Africa. On that day, in the African jungle, the herd of buffalo certainly showed the lion as to who is the boss. The proud lion had to beat a hasty retreat and forced to run for cover when buffalo he was stalking turned round and struck back. The lion swallowed his pride and sprinted away in to the bush scurrying for cover. Perhaps it was lucky to escape with his life after he misjudged his attack on a herd of Cape buffalo, was out numbered and attacked back with deadly force. It is stated that African Cape buffalo can weigh up to a ton and have powerful fused horns so strong that they have sometimes even been known to stop rifle bullets. Their herds are remarkable for their lack of hierarchy and an apparent altruism that makes them fiercely protective of calves and weaker members. When chased by predators the herd sticks close together, calves gathered in the middle, to make it hard for any one member to be picked off. They fight off threats, as in this instance, by forming a mob and charging at predators with superior weight and numbers.